This is a four tier hexagon wedding cake. The cakes were stacked, iced and put in the refrigerator overnight to chill. It is always best to chill cakes before leveling and curving. The cakes had to be slightly leveled on the side also, so once they were stacked i trimmed the edges off, this gave the a more leveled cake appearance. I would suggest that you make a dam of a thicker more playdough like icing by simply adding more powdered sugar to your original icing an place around each cake once you have leveled it, this acts as a dam to keep filling inside the cake, such as fruits or even buttercream. The cake was covered in a 50/50 fondant and modeling chocolate mix. I use this because I needed to keep the cake in the refrigerator until delivery, and using the 50/50 recipe will keep the cakes from sweating badly once they are removed from the coldness of the fridge. You can find the recipe from modeling chocolate online, and i used marshmallow fondant also found online. White modeling chocolate can be colored the same a fondant. The cakes were covered and left over night to dry some. I used a double pearl boarder, the pearls are made from the same 50/50 mix i covered the cakes with, i used the wilton mold for the pearls. 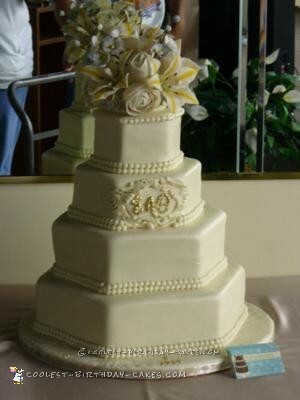 the middle tier has a monogram which was brushed with gold luster (found at any online cake suppliers). I made gumpaste lillies and ranculus flowers with hydrangea fillers for the floral topper on the cake. The whole cake was dusted with mother of pearl luster dust and pink disco dust (found online cake supply store). The disco dust gives and irredescent sparkle simular to diamonds on a cake and in a topper.